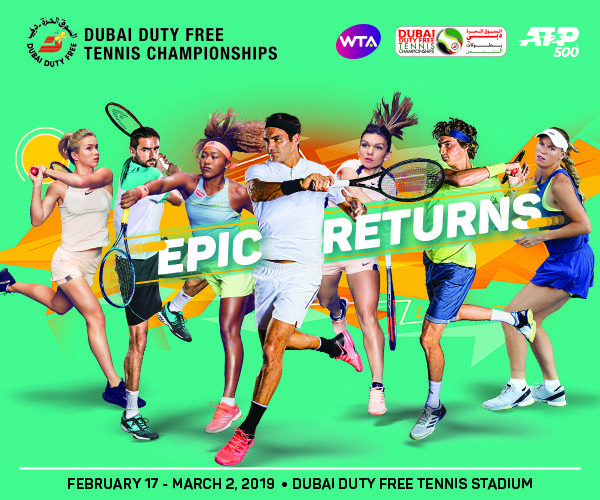 February 16, 2019 — Dubai, UAE: Elina Svitolina, who is attempting to become the first WTA player to win the Dubai Duty Free Tennis Championships title in three successive years, faces an intimidating challenge as she is in the same quarter of the draw as double Grand Slam champion and world No. 1 Naomi Osaka as well as former No. 1, French Open and Wimbledon champion Garbiñe Muguruza. Former champion Caroline Wozniacki also faces a tough draw when play gets underway tomorrow. The long-standing Dubai Duty Free ambassador, who claimed the title in 2011, will need to overcome not only a confident Samantha Stosur but the after effects of a virus that last week forced her out of the Qatar Open and into bed. That setback followed a disappointing start to the 2019 season as she was beaten by a qualifier in the second round in Auckland and then fell to Maria Sharapova in the third round of the Australian Open. Stosur, in contrast, had her confidence buoyed last month by claiming the Australian Open doubles title, and at the age of 34 her famous fighting qualities are undiminished. And also in Wozniacki’s path if she gets past Stosur in the first round are recent world No. 1 and 2015 Dubai winner Simona Halep and 2016 Dubai champion Sara Errani. Fourth seed and former world No. 1 Karolina Pliskova is in the same quarter of the draw as 2018 Wimbledon winner and No. 5 seed Angelique Kerber. World No. 2 and 2013 Dubai champion Petra Kvitova will be tough to beat as she chases a second Dubai crown. She has followed a highly successive 2018 season during which she claimed five titles with a fantastic start to the year, winning Sydney and finishing as runner-up at the Australian Open. After a first round bye she could face former French Open winner Jelena Ostapenko, 2018 Dubai runner-up Daria Kasatkina and seventh seed Kiki Bertens in her quarter of the draw. The Dubai Duty Free Tennis Championships, which is owned and organised by Dubai Duty Free and held under the patronage of H. H. Sheikh Mohammed bin Rashid Al Maktoum, Vice-President and Prime Minister of the UAE and Ruler of Dubai, begins with the WTA event which starts tomorrow until 23rd February, and is followed by the ATP event between 25th February and 2nd March.